Prime Minister Erna Solberg may well wish she’d never offered to discuss aspects of Norway’s abortion law with the Christian Democrats. Not only have they backed off on the issue during current negotiations with her government coalition, her offer to even open current abortion law to any changes has unleashed some of the toughest opposition she’s faced after five years of leading the country. She insists women’s rights won’t be weakened, but she’s under heavy pressure in Parliament. Opposition politicians simply don’t believe her, and plan to join other skeptics in more major abortion rights demonstrations this weekend. Thousands of abortion rights advocates are expected to be out marching in Norwegian cities and towns all over the country on Saturday. They’re alarmed and angry that the abortion law is even up for discussion, as Solberg’s conservative coalition negotiates with the small but powerful Christian Democrats party. Current talks involve how the the state budget should be allocated. Then the negotiations will turn to policy issues, and whether the Christian Democrats will join Solberg’s coalition government and finally give it a majority in Parliament. Solberg unleashed a hornets’ nest a few weeks ago when she expressed, on behalf of her Conservative Party alone, a willingness to discuss potential restrictions on late-term abortions with the Christian Democrats. They want to restrict what they call a sorteringssamfunn (selective society) that currently allows women to abort one twin, for example, or a fetus that shows signs of severe illness, Downs Syndrome or physical malformities. That set off an immediate and highly negative reaction from the majority in Norway that supports the current liberal abotion law. Opposition partes like Labour and the Socialist Left (SV) also seized the opportunity to criticize Solberg and warn the coalition government against doing anything that would tighten up current law. Tone Brekke of the Labour Party, however, insists the organized protests planned for this weekend are the result of “a collective women’s movement” being behind the opposition. “We don’t always agree on all issues, but here there was no question over whether we stand together,” Brekke told newspaper Dagsavisen. They clearly do, with the demonstrations jointly backed by 30 various associations and organizations led by womens’ groups Kvinnefronten, Kvinnegruppa Otta and both the Norsk- and Oslo Kvinnesaksforening. Political parties backing the protests as well include the Reds, Labour, SV, the Greens and the non-socialist Liberal Party, which is a member of Solberg’s coalition government. In Oslo, they’ll be out demonstrating in front of Parliament at 2pm on Saturday. She repeatedly stressed that she was speaking only as leader of the Conservative Party and not as prime minister, since the two other members of her coalition (the Liberals and the Progress Party) oppose any changes in the abortion law. No changes will be made if women’s rights would be weakened, she claimed, and any new restrictions would heavily weigh the evaluations of women and their families. 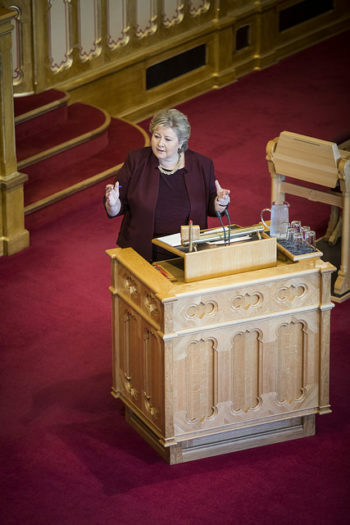 Any ultimate negotiations with the Christian Democrats “will go through all four parties,” Solberg vowed, with Parliament also given full opportunity to debate the issue. Fully 16 of 28 questions put to Solberg during the Parliament’s spørretime (question hour) on Wednesday dealt with the abortion issue. Ironically enough, the Christian Democrats themselves are now downplaying what their deputy leader had called “an historic opportunity” to change abortion law in Norway. They’re now opting to make more climate-related demands as a condition for joining the government, meaning Solberg’s abortion offer may simply have stirred up the proverbial tempest in a teapot.